10 Types Of Loans To AvoidEliminate The Muda! « Is Frugal A Passing Fad? You wouldn’t pay $50 for a $30 oil change, you wouldn’t pay $10 for a $4 gallon of milk and you wouldn’t pay $15 for a $3 cup of coffee. Each of these examples are consumables, none will appreciate in value. Is a car much different? How about furniture? Certainly after getting years of use there is still some value left in your used car or couch. If you work at it you may sell these through the classifieds or Craig’s list. If you won’t pay $15 for a $3 cup of coffee why pay $1500 for a $300 couch? If you won’t pay $50 for a $30 oil change, why pay $50,000 for a $30,000 car? 1) Pay Day Loans – Your paying interest for the right to use your own money. In some cases you may pay fees that equal as much as 911% interest! 2) Rent To Buy Furniture/Electronics – Maybe not a loan in the strictest sense of the term, in effect you are borrowing money from the store to buy their products. These companies get around many usury laws or are not required to reveal “interest rates” in many states because they treat their transaction like leases instead of like loans. A $200 TV may cost $1000 or more. Ouch! 3) ARM Mortgages – One of the most dangerous types of mortgages. Just look at what has happened to the rate of foreclosures in the past year! With an Adjustable Rate Mortgage, your destiny is in the hands of the market. Because these are relatively large amounts, when industry rates raise so will yours. The result can be a mortgage payment that rises hundreds if not over a thousand dollars each month! 4) Balloon Payment Mortgages – These differ from ARM’s in that they may or may not have adjustable rates. Initial rates are usually lower, but the entire mortgage balance is generally due at the end of a 5 – 7 year period. Most of these mortgages have the option of a reset, meaning if you stay in the house you will reset your mortgage at the current rates. Like an ARM you may end up with a much higher rate when this happens. But, you also must re-qualify for the remainder of the loan. 5) Pawn Shops – Like a rent to own in reverse, you take your stuff in as collateral. The pawn shop gives you 1/10 – 1/4 of its value in cash. Usually within 30 days you can return the money along with a 5%-20% fee. In some cases you can continue the “loan” by paying another months charges or just forfeit your property. Calculating the annual rate you may pay up 200% or more! 6) Loan Shark – You don’t want your kneecaps broken! Surprisingly I learned while writing this that physical harm is more myth than fact, but the rates that are charged can be as high as 3000%. More often when a borrower cannot meet the terms of the loan they end up paying off the loan in kind with food stamps, welfare checks or maybe that TV that was purchased from the rent to own place. 7) Loan Consolidation – When swimming in debt this is a common approach to get things under control. While it is possible to reduce your interest rates, with longer terms you may end up paying a greater total amount in interest. What I learned today was these loans are often secured; miss your payments and you could lose your house or other property. The biggest concern however is these loans only address a symptom of your problems. By clearing the decks of your debt you are in the position to simply dig yourself a deeper hole as I did when I took a debt consolidation approach. 8) Credit Cards – Of all the options we have reviewed so far, this could, unbelievably, be the lowest cost. 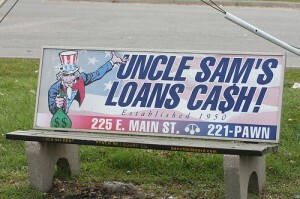 However loans (cash advances) against your credit cards can be very expensive. This is primarily because card companies look at advances different than regular charges. Card companies will charge you an upfront fee of 2%-4%, plus they often charge higher interest rates, plus the often provide no grace periods for these advances meaning that finance charges start piling up right away. 9) Loans From Family/Friends – “Neither a borrower or lender be; for loan doth oft lose both itself and a friend” Shakespeare. A quick Google search on this one is interesting, sites writing from the perspective of the borrower detail how this can best be accomplished providing the loaner with confidence and contracts and meeting IRS regulation. Every site writing from the perspective of the loaner says DON’T DO IT. I have a little experience with both being loaner and a borrower in my past. In every case it did affect the relationship negatively. 10) Car Loans – On a $20,000 car loan you may have to pay $2,000 or more in interest and fees. But the minute you drive off the lot the car may only be worth $16,000. By the time you finish paying for the car it may only be worth $13,000 or less. How much time do you really spend in a car and what is it really used for? If all you need is transportation, won’t a good quality used car suffice? Buy a used car, then take the $500 each month you would have spent, pay down debt or better yet invest it. In 20 years with a 7% return you will have over $250,000. Then you can afford to pay cash for almost any car you would want! This information is very useful ,thank you for sharing!